.......53 Buddhas and Me .................My Life Adventures.....: "My Eyes Hurt"
Yeah, that's right my eyes hurt. This is my latest creation for my new up and coming business - "DavineRaeDesign". 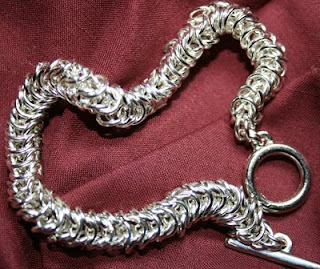 It's an "Inca Puno Chain Maille Bracelet" . I really like it, it has actually turned into a sort of square chain. I spent most of yesterday making it. I think next time I attempt a new design I will make the first sample from larger jump rings - might make it a bit easier on the eyeballs. My brain has gone into overload at the moment with all the designs I want to make to add to my collection. I guess now I need to work out the best way to sell my designs - so many ways - markets - ebay - website - shops - which direction do I go in?????? Wow, this sure does look fantastic and like it was a ton of work! You have a gift Davine, I'm sure that you will find your best marketing position in no time and soon enough you will have problems keeping up to the orders! I wonder how a person gets a celebrity to wear their design/fashion? Heck you'd have to hire staff if you can sort this one out and have somebody famous wearing your jems! Absolutely Stunning, Davine! I feel that 'tired eyes' are a small price to pay (although I am sure that you might not feel the same way) for such a lovely creation! Maybe you could bring some of your designs to our workshop?